As you enter into the heart of the Napa Valley on the scenic Highway 29, a striking sign greets visitors with a quote from famous poet Robert Louis Stevenson, “…and the wine is bottled poetry.” When Cliff Lede purchased a steep hillside vineyard in the Stags Leap District, he took a cue from Stevenson and named the vineyard “Poetry.” Likewise, a few years later, he opened the luxurious five room Poetry Inn on that same hillside. The scenic terraces of the estate Poetry Vineyard bear the fruit for Cliff Lede’s flagship Cabernet Sauvignon, Poetry. The 2015 Poetry Cabernet Sauvignon is SOLD OUT. 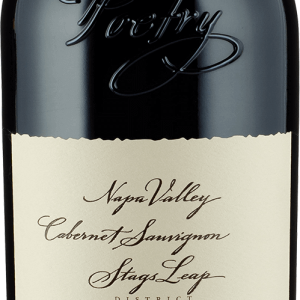 Each fall, we offer the newest release of Poetry Cabernet Sauvignon to those on the Poetry mailing list. The wine is sold in handsome custom wood boxes in six-packs of 750mL bottles, or individual 1.5L, 3L, or 6L bottles. Join our wait list to express your interest in acquiring the next release. Those interested in securing each new release of our three elite “Platinum Playlist” Cabernets, including Poetry, Songbook, and Beckstoffer To Kalon, should contact our Wine Concierge. Platinum Playlist memberships may be available. There are pretty violets among the mineral aromas with black currant, lavender, and spice box notes unfurling out along the bouquet.